Frenchy kidded two doelings. They were about two pounds at birth and in 48 hours had doubled in weight. Go Frenchy! Tan and white buckskin, brown eyes. We will be selling babies we would love to keep, but the space we have in our barn says otherwise. 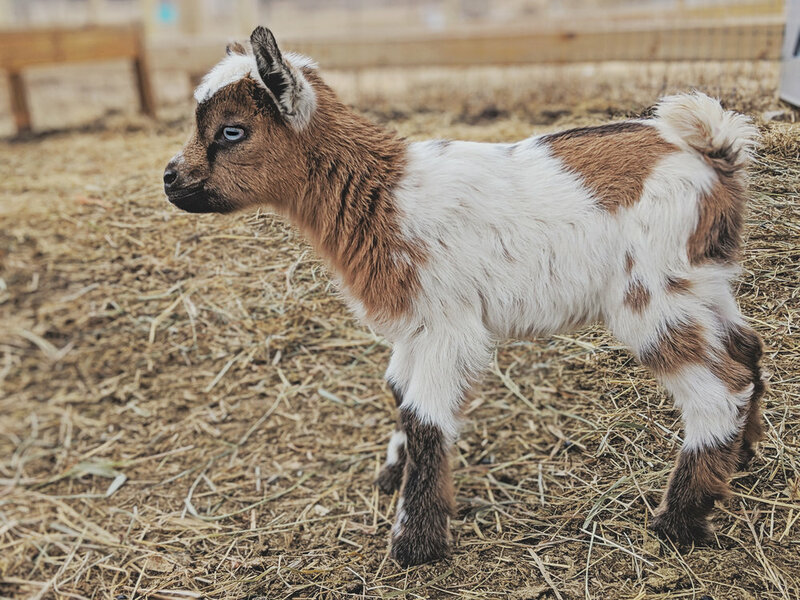 So our plan is to keep 1-4 kids this spring which sadly means doeling 1 is available for purchase. Her coloring is unique – a grayish tan similar to our Sunday. All of our goats are ADGA registered. Doeling will be disbudded and tattooed. She will be ready to be weaned and picked up the last week of May. Tri-colored (just like Frenchy) with blue eyes. She was exactly what I was hoping to get out of breeding Harvey and Frenchy together. Frenchy is a first-time mama. We haven’t put her up on the milk stand since kidding a few days ago, but her pre-fresh udder was so impressive! One of the many reasons we brought Frenchy into our herd was her sire is quite impressive and has many kids that went on to appraise and show well. She had a little trouble understanding how and why to nurse her babies at first but now she has it down and has proven to be a natural. It’s such a beautiful transition to watch any creature step into this motherly role. I know “they’re just goats” but we could see the confusion, stress and hesitation all over Frenchy’s face when her kids were first born. The next morning, she was obviously just so in love with these two girls, talking to them non-stop and never wanting to leave their side. We let her stretch her legs in the pasture and when she heard one of the babies cry, she came running back to the barn. So sweet. 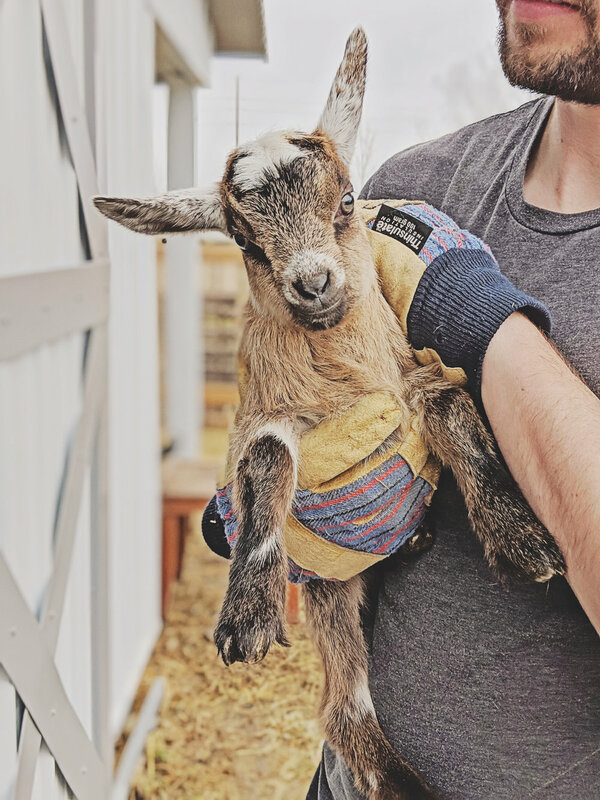 We purchased Frenchy from Bear Park Bluff Goats – who says of Frenchy’s sire, “This little guy is jam packed with heavy milkers, champions, and extremely beautiful animals!” I was already 95% in love with Frenchy and I looked into her sire and SOLD. She’s mine. And again, going by her pre-fresh, first-freshening udder… this was a great choice for Wildroot Cove. See more of Frenchy’s sire and dam. 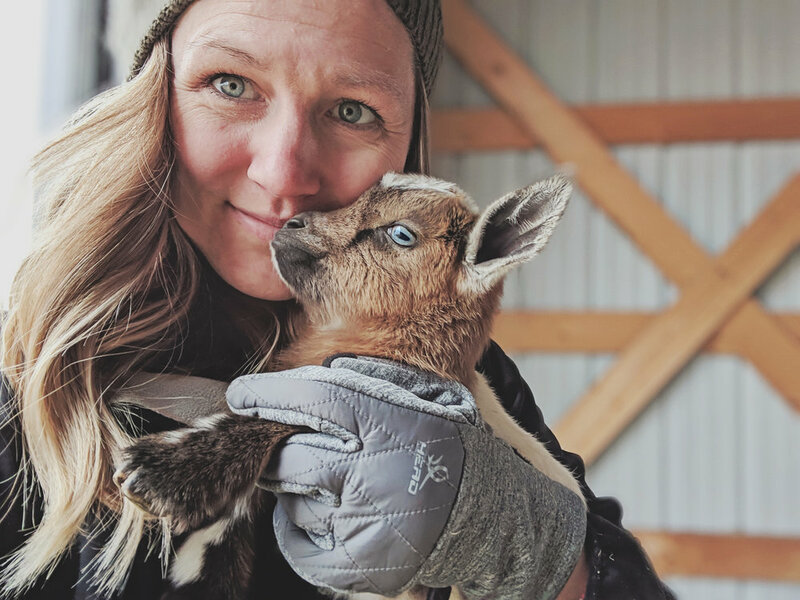 We appreciate Robyn at Bear Park Bluff Goats as we have been following her for a few years and consider her one of the best! They say to invest the most in a quality herdsire... so we did. Harvey has a stellar sire that scored EVE FS90 @ 02-02. His dam is a 4* milker. 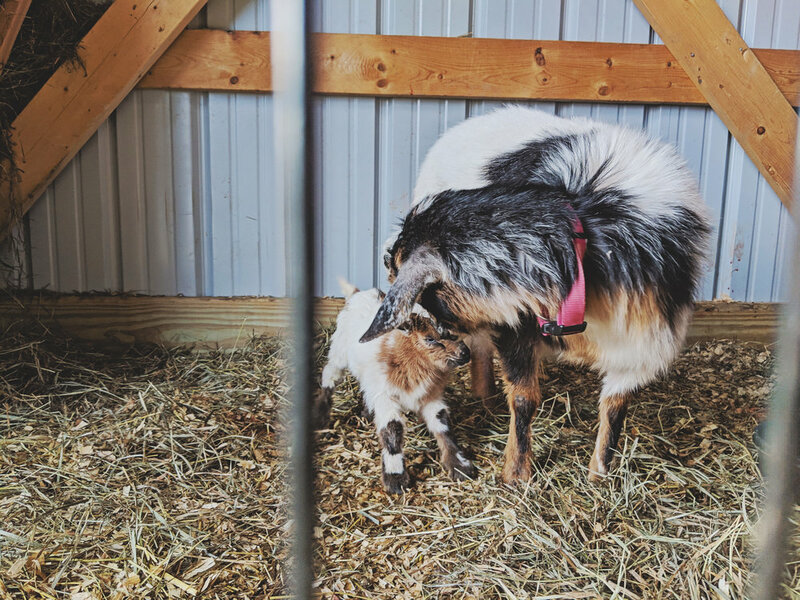 We were hoping to rent a buck when we reached out to Renegade North, who was in the process of moving out of state so we impulsively bought two of their quality bucklings to improve the genetics in our herd. See more of Harvey’s sire and dam.